Finance – ATM’s, banking transactions, etc. These are just a few of the embodiments as to how our technologies can be used. They can be used to address the security needs of solutions for data in motion and data at rest. UPONUS’ solutions are fast, easy to use and implement, and provide an unmatched level of security. The examples above and the discussion below of the mobile security solution all address issues of securing data in motion. UPONUS’s technologies and solutions can also be used to protect data at rest. UPONUS’ SeMo, is an innovative mobile security solution that greatly enhances the security of digital communication and is extremely easy to use and to administer. SeMo is not susceptible to any known form of cipher attack. SeMo employs a two layered encryption scheme. The first layer of enhanced security uses the well-established and proven OpenVPN® to create a secure communications tunnel between the mobile devices and SeMo servers using AES 256 CBC encryption and standard 2048 bit PKI certificates, unique to each user. Before a packet is sent through this secure tunnel, every voice, instant message and attachment packet are automatically pre-encrypted using UPONUS’ patented encryption algorithm called SASE™ and unique randomly selected secret keys from our patent pending key management systems, KMS™. SASE currently utilizes a cryptographically secure random number generator, creating keys ranging in size from 256 bits up to 524,288 bits per packet. This is significant because someone trying to hack into a communication has to hack though two distinct layers of encryption, using two different algorithms and two unique and distinctly random keys. 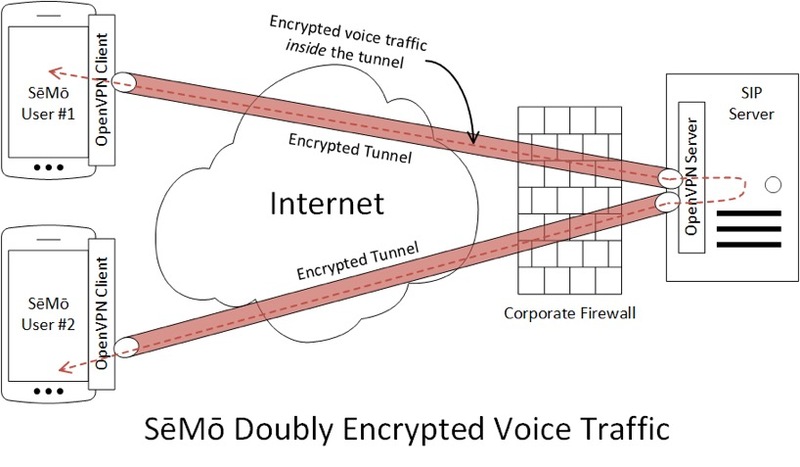 Further, SeMo uses 6,000 randomly selected unique keys per minute for voice calls which means that even if one of the keys for one of the blocks was obtained through a brute force attack, if the hacker could get beyond the OpenVPN security tunnel, the remaining communication is still secure with the second layer. The KMS process in SeMo randomly select secret session keys used for each packet of data for secure communication between pre-authorized and pre-authenticated users for immediate communication without the need for key exchanges. A discussion of the processes and benefits of SASE and KMS can be provided. SeMo is a secure communication mobile phone application (app) that protects voice, instant messages, and attachments. SeMo provides more protection and security than all other solutions such as Viber, WhatsApp, etc. SeMo is the only true two layered encryption application. 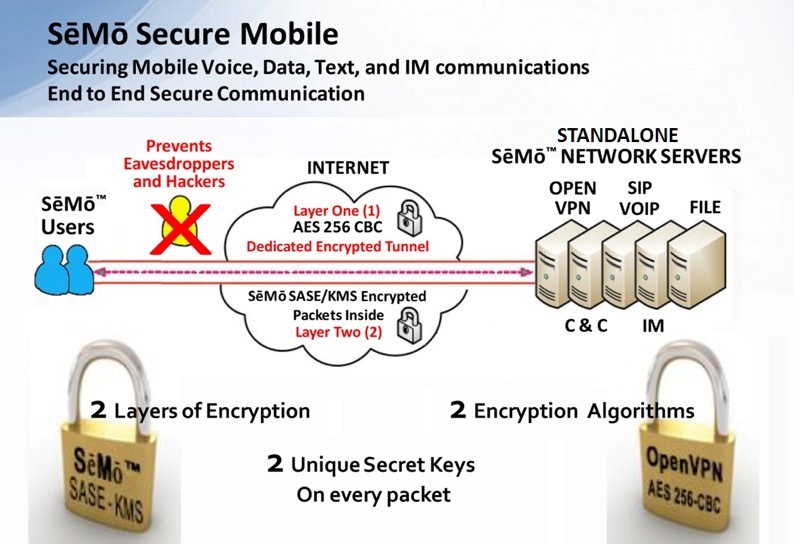 The first layer of encryption; SeMo uses the approved universal standards, AES 256 CBC, and pre-issued and pre-authorized unique PKI certificates to create a secure OpenVPN tunnel between pre-approved mobile devices and the SeMo secure network. The second layer of encryption; SeMo encrypts every packet being sent through the secure VPN tunnel using UPONUS’ patented encryption and patent pending key management system which generates a separate random secret key for each packet created by the sending device. A SeMo voice call uses more than 6,000 different keys for every minute of voice communication. While all other secure communication solutions use just one 256 bit key for the entire session, SeMo uses a different unique key for every packet with key sizes ranging from 256 bits up to 524,288 bits chosen at random. SeMo is not affected by malware, when the proper precautions are taken. SeMo requires only limited permissions; and as a result, minimizes the risk that the communications will be compromised. Further, if the necessary precautions are taken to prevent malware from being added to the device, the communications are secure. SeMo uses a closed system of secure servers, located behind the OpenVPN firewall. The SeMo secure network servers are: the Command and Control server,- so that only pre-authenticated and pre-authorized users can be members of the SeMo secure communications network; the SIP server - setting up the sessions between pre-authorized and pre authenticated SeMo users; and the temporary Secure Storage server – to store instant messages and attachments until they reach their intended receiver. Regardless of delivery, all instant messages and attachments are deleted from temporary storage within 24 hours. The fact that SeMo is a secure VPN and closed network means that it cannot be infected from outside hackers. All SeMo users are pre-authorized and pre-authenticated, and only the intended recipient can access the information communicated within the system. All data stored on the server is stored in an encrypted state, encrypted by the sender; and deleted every 24 hours. We do not use the smartphone phone numbers for authentication and authorization; we use only the phone IMEI or MEID number of the device, and other unique numbers only known to the SeMo system. SeMo is an insurance policy that provides the protection for those companies or governments that do not want anyone other than those who are pre-authorized and pre-authenticated to be part of an ultra-secure communications group. The bottom line is that we are fundamentally different in how we protect communication from any other solution on the planet. SeMo is merely one embodiment of how UPONUS’ technologies can be used. Our technologies can be used to address the security of both data in motion and data at rest. The discussion of these other applications will not be covered here. SeMo network traffic is comprised of “packets” of information that travels between the end-users’ handsets or devices (soon tablets, PCs, desk phones, etc.) and the SeMo Enterprise Servers which can reside in the enterprise customer's private network. All packets containing voice, text messages, and attachments (audio, images, video, Word docs, Excel docs, PowerPoint docs, PDF’s, and other file formats) are first protected by patented SASE™ encryption and KMS. Adding the extra OpenVPN secure layer to the architecture ensures that ALL packets are now fully encrypted and protected, which results in all the data payloads of voice, instant message and attachment(s) being encrypted twice (once by SeMo and once by the OpenVPN), for double security that protects the identity of the users and the privacy of all transactions between SeMo users. Instant, secured communication between pre-authorized and pre-authenticated secure contacts using off-the-shelf devices. Real time secure communication with virtually no added latency. Security is transparent to Users with no human interaction required for the system to function properly. Works seamlessly with many smart device operating systems. Secure Multicast Text messaging so that broadcast texts can be sent to all or partial secure contact members. Secure Multicast Text allows for sending attachments including photo images, videos, audio, PDF’s and other file formats. For adding, deleting, changing or burning any or all secure contacts within seconds of the command. For adding, deleting, or modifying Secure Contact Groups and Random Number Tables almost instantly. SeMo provides the renewed confidence for governments and businesses that for the first time their confidential communications will be protected and secure. These innovative breakthrough technologies in UPONUS’ SeMo mobile applications offer far reaching uses when UPONUS’ SASE encryption and KMS – key management systems are applied in other areas of data communication, data storage, healthcare, banking and financial transactions, the power grid, satellite communications, and entertainment industries.